Why not tour Tantallon Castle today? 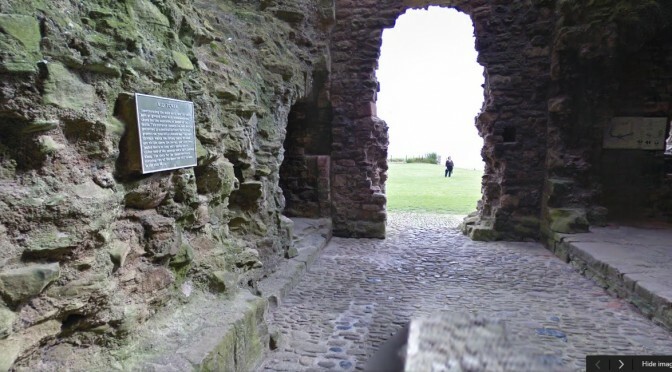 Historic Scotland, with Google Street View, have now captured virtual tours of a number of historic Scottish castles and other monuments – and a couple are in East Lothian. Both Dirleton and Tantallon Castles are amongst the sites you can visit. Why not take a tour today? You’ll find you can move around even in the embedded image below – just drag the image with your mouse to get started. Scranalogue is the new home for rolling news, features, updates on Scran collections, learning and teaching materials and insights into our outreach activities. 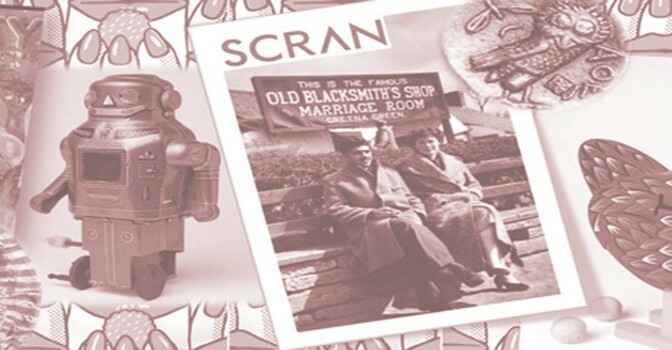 Scran’s work with Skills for the Futuretrainees on The Scotsman Collections, a rich seam of social history on Scran. New Pathfinders about Scotland’s historic propertiesin English and Gaelic, developed in partnership with Historic Scotland. Visit our blog to find out more. 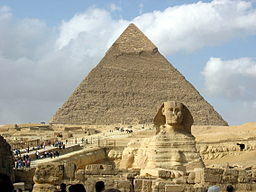 National Museums Scotland are currently developing a new gallery about Ancient Egypt and we’re looking to hear from teachers about what they’d like to see in it. 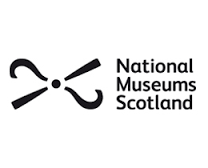 Christmas is nearly upon us so I thought it was time for another update from National Museums Scotland! We have a special discount for teachers on our children’s books from the Scotties range, perfect for topics like Romans, Mary Queen of Scots, Jacobites and many more. Find the full list of titles attached. When buying online, you will receive these books for £2.99 (for those usually £5.99) or £3.99 (for those usually £6.99). Some are discounted at the moment anyway, but the code will give you discounts beyond Christmas and on some of those that aren’t currently discounted. Our next big exhibition is Photography: A Victorian Sensation. We’ll be offering free school visits to this exhibition which runs from 19 June- 22 November 2015. 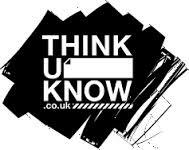 Keep us in mind if you’ll be covering Victorians in the summer term, or in the new school year. More information will be available shortly, and bookings will open after the Easter holidays. We’re looking for teachers to help us develop our new Ancient Egypt galleries in early 2015. In return for spending a day discussing the new developments with us on a Saturday in January/February, we’d provide you with lunch, refreshments, plus CPD & resources for your class. If you’d be interested, I’d love to hear from you. If you have any other questions, get in touch. Have a lovely festive holiday! Featuring 100+ playable games, take on gaming’s greatest icons at the National Museum of Scotland. Wiki*edia Projects in Schools, for Teachers – and a Hallowe’en TeachMeet! This Friday at 2pm, teachers in the Edinburgh area are invited to join an exciting open session at the fully-booked EduWiki Conference 2014. And if you can’t make that, there’s also an Edu Wiki Hallowe’en Edition TeachMeet at 7pm in Edinburgh. More on that, incuding sign-up link, here. The 2pm session, Workshop C: Wiki*edia Projects in Schools (for students under 18) is led by Daria Cybulska, Wiki Media UK Programme Manager. If you’re interested, you’re encouraged to contact Ally Crockford at a.crockford@nls.uk. 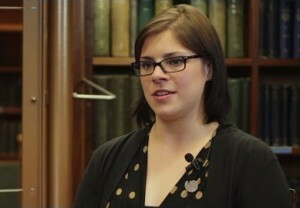 Ally Crockford, Wikimedian in Residence at the National Library of Scotland explains the connection in a guest post on the Engage for Education site. There’sWikivoyage, Wikidata, Wikiversity, Wikinews, Wikiquote, and Wiktionary, too. They’re all hosted by the Wikimedia Foundation, a non-profit organisation that develops and maintains the open content on these sites provided free of charge. With all of these projects seeking to provide various educational components freely and openly, it’s exciting to see the different ways that educators from all levels have begun to interact with them. EduWiki is a conference designed in part to showcase the newest and most innovative educational collaborations with Wikimedia in the UK. Glow now has a different login screen, shown left, and the login process has changed. What’s going on – and does it matter? 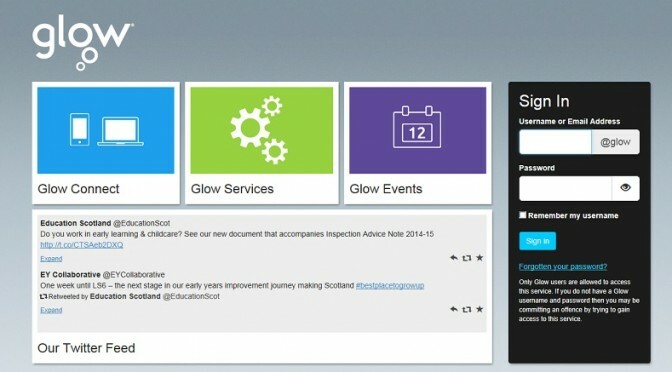 The Glow Connect tile links to a public blog which serves as a one-stop-shop for information about Glow changes. The Glow Services tile links to a page on the Glow Connect blog with a summary of some key services: Office 365, RM Unify, WordPress blogs and Broadcasting. The Glow Events tile links to a page on the Glow Connect blog which is the new home of Glow TV. 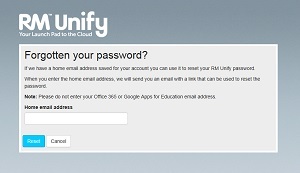 Following the shutdown of the old system, Glow now uses RM Unify to manage the login process. The sign-in box looks different, but uses the same username and password. 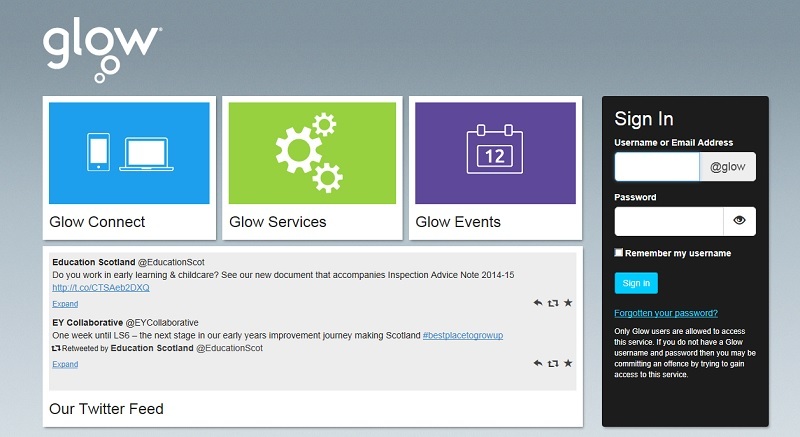 You can ignore the “@Glow” bit, and just enter your existing username and password. When you log in to the new system for the first time, you’ll be asked to provide an alternative email address for password recovery. That’s simply to enable Glow to send out a new password by email. Either a school email address, or an eduBuzz Google Apps email address, would be fine for that, but there’s nothing to stop you choosing to use a home email address if you want. Copyright and Schools (http://www.copyrightandschools.org) is a new resource that makes it easier than ever to get to the information teachers need. This information is notorious for being fragmented across a lot of web sites, and being presented in less than accessible formats for busy teachers, so this is a welcome development. Into Film is a new Lottery-funded education charity founded by previous film education charities, FILMCLUB and First Light. Into Film aims to bring opportunities for watching, making and understanding film to all 5-19 year olds. Through Into Film teachers can access free DVD rental, learning resources linked to Curriculum for Excellence, CPD and training, support for setting up a film club or filmmaking activities, and exciting opportunities for pupils including in-school visits, free cinema screenings and a talent development programme. Learning through film is an exciting and innovative way to engage with pupils and is very relevant to Curriculum for Excellence. Several schools across East Lothian are already involved in Into Film and it would be great to get more schools benefiting from this free education programme. Into Film is free to join and you can find out more information about the bespoke programme in Scotland at www.intofilm.org/scotland. For more information or to register email support@intofilm.org or call 0207 288 4520.